Indianapolis, Ind. (August 29, 2018) — Del Worsham’s illustrious drag racing career, in both Funny Car and Top Fuel, is well documented and highly lauded. His winding path to this year’s running of the historic NHRA U.S. Nationals, at Lucas Oil Raceway in Indianapolis, has nearly as many plot twists as a mystery novel, although most of Worsham’s fans see it as a heartwarming “full circle” story. Worsham started his career as an independent racer at the young age of 21, driving his father Chuck’s Funny Car to a pair of wins during his rookie season in 1991. For six years the Worshams toiled without a primary sponsor, taking on the big hitters in the Funny Car class while overcoming explosions, fires, and hospital stays. Everything changed in 1997, when CSK Auto delivered the racing family their first major primary sponsorship, which lasted 12 seasons and featured enough wins (20) to bust his trophy case. When CSK was purchased by another auto parts retailer in 2008, Worsham made the jump to Al Anabi Racing in 2009, where he won the Top Fuel World Championship in 2011. From there, it was on to Kalitta Racing, where he added the Funny Car World Championship to his mantle in 2015, becoming only the third driver ever to win both nitro titles, along with Kenny Bernstein and Gary Scelzi. Those 20 years of heavily sponsored racing, however, left Worsham wanting something different. He craved the memories and the camaraderie he experienced racing with his father as unheralded underdogs. 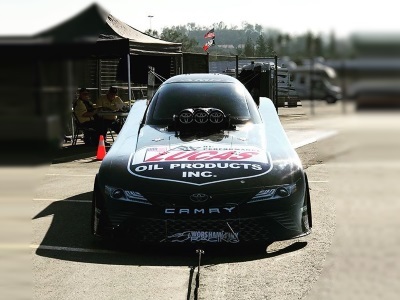 In 2017 he made the decision to return to his roots, joining his dad along with a small band of former crew members and a number of ultra-loyal associate sponsors, to race once again while taking on the best Funny Car racers in the world. As this weekend’s U.S. Nationals approaches, Worsham has reflected on his long run in the nitro classes, his stirring “double up” win at Indy in 2005, and his return to his family-operated roots. With a strict budget in place, he has competed at a limited number of events this year, but he knows better than to count himself out at the race known as The Big Go. “Looking back on everything, it’s just kind of startling how much time has passed and how many things have happened over the decades, both good and bad. We’ve seen the very top in Indy, back when we won the race and the Shootout in 2005, and took home close to a quarter-million dollars in one weekend. I’ll never forget that. “The days when we first started, with just a little help from a few friends and whole lot of desire, were priceless too. Without all the learning and challenges we faced in the early 90s, I don’t think the CSK deal would’ve happened for us. We earned that, the hard way. And then to grow that program like we did, with the fantastic people at CSK, well that was life changing. To go on to race for Alan Johnson and win the Top Fuel championship, and then have the equal honor of racing for Connie Kalitta and winning a championship for him in Funny Car, it’s hard to put into words what all of that meant. “This year has been tough, in a lot of ways, and neither my dad or I like running in the back of the pack or struggling just to qualify. We know how to win, and we work at it hard enough to earn it. We’re coming to Indy to do the best we can. How good is that? Well, the best we can be is a team that can win any race, including the U.S. Nationals. We can absolutely do it, and I’m not heading into the race with the idea that it would be cool to make the field. I’m not counting myself out. I’m counting on myself to be solidly in the mix and we’ll give it everything we have to get back up on that Winner’s Circle stage with the trophy.